LG has announced the 34WK95U, a new “dream monitor” for prosumers, gamers, multimedia enthusiasts and everyone who needs a large ultra-wide screen along with a high resolution that is beyond 4K. The new 34” display is expected to be available sometimes in 2018, but LG does not say when. The LG UltraWide 34WK95U uses an IPS panel with a 5120×2160 resolution (which the manufacturer calls 21:9 5K ultra-wide) and the recently announced Nano IPS technology. The initial benefit of a 'wider than 4K' resolution (5120-wide vs 3840-wide) is for 4K content creators to see a whole video with UI elements down either side. The Nano IPS technology enables the panel to deliver "a broad range of accurate colors", as LG puts it. Given the fact that another Nano IPS-enhanced display from LG features a professional-grade DCI-P3 color space coverage, it is reasonable to assume that the 34WK95U can also cover a comparable percentage of the DCI-P3 color space, which would be something we have not seen on consumer monitors with a 21:9 aspect ratio so far. However, LG does not outright say that its 5K ultra-wide LCD supports the DCI-P3. The display does carry VESA’s DisplayHDR-600 badge, so it supports HDR10 processing and up to 600 nits brightness (but we know nothing about possible local dimming support needed to hit low black levels). Moving on to connectivity. 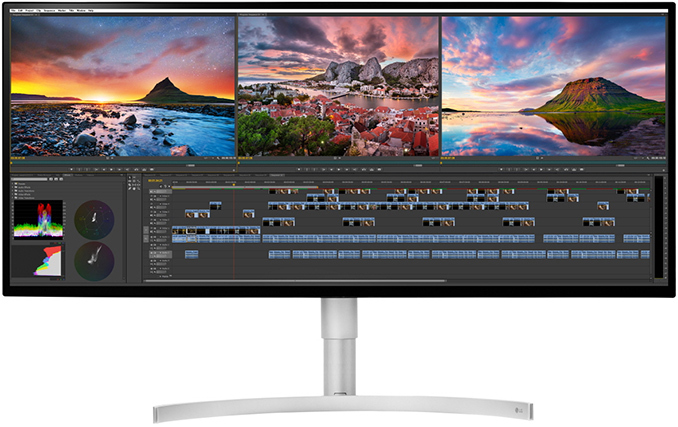 A particularly good thing about the UltraWide 34WK95U is the Thunderbolt 3 input that enables to connect the display to an appropriate PC using just one cable and even feed up to 60 W of power back to the host. It is reasonable to expect the display to support other inputs like DisplayPort and HDMI as well as feature a USB 3.0 hub, but LG is not disclosing exact specs of the product right now. Over the past few years LG has done a great job popularizing the ultra-wide 21:9 aspect ratio by introducing multiple 21:9 displays itself and selling the panels to other makers of monitors. Without any doubts, ultra-wide displays are very handy for gamers and users who multitask a lot (designers, engineers, traders, photographers, video editors, developers, etc. ), but the maximum resolution offered by such monitors up to this point has been 3840×1600. This resolution is enough to playback UltraHD content filmed in an aspect ratio of 2.35:1 or 2.40:1 (movies), but if a user needed to watch/edit 3840×2160/4096×2160 content, or just require more vertical pixels (e.g., for large images or long texts), such displays were not an option. The LG UltraWide 34WK95U solves this problem by going 5120×2160 pixels and granting people who work on 4K content some additional screen real estate for various UI panels when they work on a project fullscreen. Speaking of content creators, it must be noted that the LG34WK95U is a consumer monitor. Even if it supports the DCI-P3, it is most likely tailored for the consumer version of the DCI-P3 color space, not the digital projection version with its different white point and gamma (this is an educated guess rather than official information though). 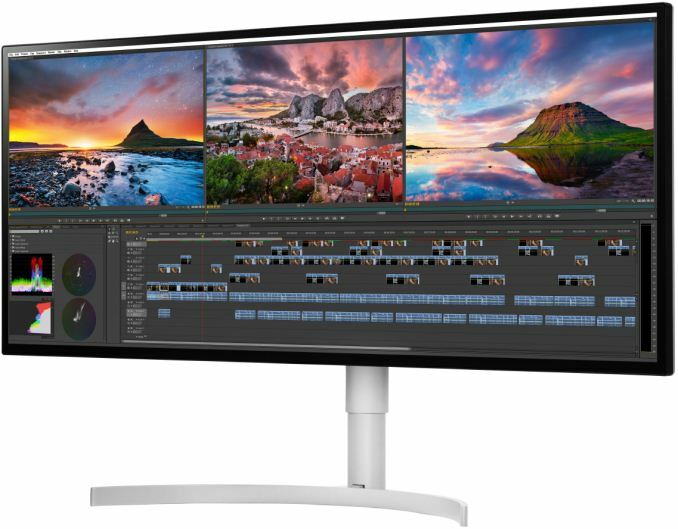 LG is set to showcase the UltraWide 34WK95U at CES next month and this is where we going to learn more about this monitor. The company is tight-lipped about ETA and MSRP of the display, but since this is a unique product and some of its predecessors still retail for $1250 - $1600 more than a year after the launch, expect the price of the 34WK95U to be higher than average for a premium consumer LCD. Color Saturation "broad range of accurate colors"
In addition to the high-end UltraWide 34WK95U, LG also announced the UltraWide 34GK950G display for gamers. The 34GK950C monitor boasts with a QHD resolution (2560×1440 pixels), NVIDIA’s G-Sync dynamic refresh rate support as well as the Nano IPS treatment for improved colors. The company did not disclose any additional details about the 34WK95U, but since it will be demonstrated at CES next month, more information will be available there. This is a love-hate monitor. It looks amazing, but at the same time the resolution is infuriating. At 200% scaling everything should look crisp and perfect, but... Too large. Exactly like in1080p 34 inch monitors, minus the "retina" resolution. IMO it's the perfect resolution. More accurately, it's the perfect DPI, 160. I call it just-barely-retina. 1: it's technically retina. In other words pixels are smaller than the average eye at the normal distance can't resolve pixels. Some will claim that once you hit retina more resolution doesn't increase quality. That's not quite true, but there is a grain of truth there; past the retina limit there are much diminished returns to an increase in resolution. But there are significant costs in terms of GPU resources required to drive it well. It's the equivalent of 80dpi which is too big. This is not a grandma monitor. This is meant for information dense use cases. At 2880 the monitor would be DPI equivalent to the ubiquitous 1440 27" monitors. At 200% scaling there are no scaling artifacts as in, let's say, 150%, as non-HiDPI apps just use groups of 4 pixels. 34" 3440x1440 is dpi equivalent to 1440p 27". I have both. Sitting next to each other. It's exactly the same scaling. I think people are confusing the physical DPI (PPI) of the display with the size of a "point" of a operating system’s UI. At the optimal and sharp, 2:1-scaled UI resolution the display would be showing the same "amount of UI" as a 2560x1080 "non-retina" display would, which on a 34" screen is way too large. Without OLED contrast you get more shiny whites while pretty much giving you eye cancer if you dare to see dark conent, and pretty much kill your brain on a dark room. More than HDR, people are happier when they rediscover the black color of old CRT and dead plasmas with OLED.